We will let you into a trade secret, Acorn stairlifts are in effect the same product as the Brooks stairlift sold by mobility dealers throughout the UK. They are even manufactured in the same factory. The only difference between the two products is they are branded differently by the manufacturer. The Acorn version is grey in colour the Brooks is cream.The only other incredible difference is the price. We supply the Brooks branded version. If you buy directly from Acorn you will more often than not pay more than from a dealer. How can this be you may ask? You may have been led to believe that buying directly from the manufacturer is always cheaper. Well that is not the case! Acorn have massive marketing costs to cover including national TV and newspaper advertising. Dealers buy in bulk from the manufacturers and act as brokers for the same product. They don’t have the high overheads the manufacturers have and make much leaner margins when they sell the stairlifts, hence the massive price difference. The warranty cover is also exactly the same. * If you are looking to buy a new straight stairlift and there are no complications, if you order online we will install a new Brooks stairlift for just £1395.00, no strings attached! No sales person needs to call. You have your price fixed! Your Brooks Stairlift is guaranteed for a period of 12 months from the installation date. The guarantee covers you for all mechanical failures through defects in manufacture. WHY NOT CONSIDER A BROOKS STAIRLIFT? There are various reasons why people have difficulty getting up and down the stairs, usually due to illness or aging. Something that starts as a slight annoyance can quickly turn into an inability to climb the stairs, resulting in frustration and a feeling that there maybe no positive solution. Many people think that the only option is to rearrange their home completely, moving their bedroom downstairs, or in extreme cases, move to a house or flat on a single floor. This simply isn't the case! The perfect solution to your mobility needs is a stairlift, allowing you freedom of movement and a new sense of independence. Brooks is considered to be the premier manufacturer of today's innovative stairlifts. Established in 1992 in Yorkshire, England, Acorn Stairlifts are pioneers in the industry, the first company to use DC technology, which is now standard amongst their competitors. Whether you require a straight, curved, or even an outdoor stairlift, you will find exactly what you are looking for. Brooks are proud to offer the Superglide stairlift, suitable for straight stairs, and the Brooks 80, perfect for a curved stair. Featuring a slim-line design, the padded seat, arms and footrests can be folded up when not in use, allowing for ease of access when other people use the staircase. The stairlift is operated by an easy to use directional switch; in addition there are two hand-held remote controls, allowing the user to send the lift up and down the stairs,according to requirements. This is especially handy when two people are using the lift.Five safety sensors will halt the stairlift's movement immediately if there is an obstruction on the stairs, meaning that there is no chance of causing damage to the lift. 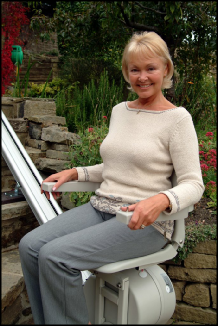 The seat has a lockable swivel mechanism, allowing the user can get on and off the stairlift without having to twist their body in any way, and for added security, there is a sturdy safety belt. If you aren't able to sit, the stairlifts have a standing or perching option,meaning that if you are unable to bend your knees, you can still use the lift with no problem. For security, it has a lock, preventing other people from using it. You will have peace of mind if you ever experience a power cut, as the stairlift operates via two DC batteries,which are constantly recharging when it is plugged into the mains. 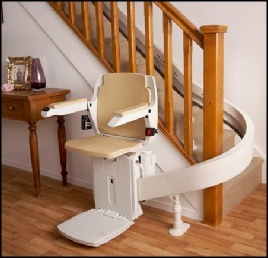 For people who need a stairlift outside the home, Acorn has a weatherproof version of the Superglide that is perfect, even in inclement weather. If you decide that a stairlift is the solution to your problems, the first step is to have an experienced technician visit your home and take detailed measurements of your stairway. Installation of your stairlift is extremely easy, taking as little as an hour for a straight stairlift,whereas a curved option takes just four to five hours. The beauty of an Brooks stair lift is that it is attached to the stair tread as opposed to the wall, meaning as little mess as possible when it is being installed. Brooks stairlifts are extremely affordable, and once installed, cost less than £10 a year in running costs. If mobility is starting to be a problem in your life, always remember that there are options out there to make things easier for you, and when you purchase a Brooks stairlift, you won't be disappointed! With 25 years experience in the mobility industry,we recommend Brooks stairlifts,manufactured by Acorn, as our product of choice. Why? because they are extremely reliable, safe and whisper quiet.